Northern Ireland's Stuart Dallas and Gareth McAuley (right). Veteran defender Gareth McAuley has expressed his pride at seeing Northern Ireland progress to the last 16 of Euro 2016 on Tuesday night. A 1-0 defeat to Germany in Paris did not prevent Michael O’Neill’s men from making it out of the group as Turkey beat the Czech Republic 2-0 later that evening to ensure Northern Ireland went through as a third-placed team by virtue of a better goal difference than the Turks and Albania. Northern Ireland were the first team from pot five to top a European CHampionship qualifying group and many pundits gave them little chance of making it out of the group at the tournament, yet O’Neill’s side have extended their French sojourn and will meet either the hosts or Wales this weekend. 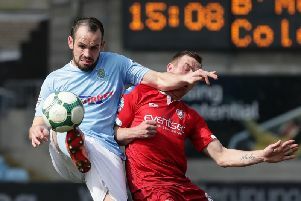 “It’s an absolutely incredible achievement by everyone involved,” McAuley said after learning of his country’s progress. “Not just the players involved but everyone included. It’s made it a fantastic tournament for us to be involved in. McAuley and his team-mates were unable to seal their progress themselves at the Parc des Princes following a 1-0 loss to Germany when Joachim Low’s men produced a performance befitting of their world-champion status. That it was only 1-0 was largely down to goalkeeper Michael McGovern and his string of saves which included terrific stops to deny Thomas Muller, Mario Gotze and goalscorer Mario Gomez. “We’ve taken on the world champions there,” McAuley added. “We rode our luck and McGovern was fantastic. Even though we lost 1-0 it feels like we got something, like a win or a point from that game. “We need to sleep on it to hit home. We’re travelling back and have another game, we don’t know who that game is but we’re looking forward to it. The performance of McGovern, who is out of contract with Scottish side Hamilton at the end of this month, was brighter than any of the German stars could produce. Germany boss Joachim Low claimed he was aware of a keeper that may have been unknown to the rest of the continent and highlighted his role in thwarting his team. “Of course I have heard of him before, we have analysed the opponent,” Low said. “I have to compliment him. He has kept goal brilliantly and shown great reflexes.